What were the major marine animals living during the Triassic period? There were many marine animals that swam the oceans of the Triassic, and many of the species still continue to this day. In general, the oceans held the following animals, although with new fossil discoveries, this list may eventually change. Ichthyosaurs: Also called “fish reptiles,” these were predatory sea reptiles that probably preyed mostly on shellfish, fish, and other marine reptiles; they looked similar to, and probably had some of the same habits of, modern dolphins, whales, and sharks; they lived in the oceans from the Early Triassic to Middle Cretaceous periods, probably out-competed by the mosasaurs of the Middle Cretaceous period. Plesiosaurs: Medium to large, long-to short-necked reptiles, with bulbous bodies; their four legs were modified into paddles; they probably ate mostly fish; they lived mostly in marine environments, but some also lived in freshwater lakes; they lived from the Early Triassic to the end of the Cretaceous period and are often sighted as the model for what the Loch Ness monster is presumed to look like. Placodonts: Large marine reptiles that had a long trunk and tail, with feet that were probably webbed; their teeth were using for crushing, and they probably ate clams and other shelled invertebrates from the ocean floor. Nothosaurs: Small to moderate-sized marine reptile with long necks and sharp, conical teeth for spearing fish; their legs were modified flippers, rather than the paddle-shaped legs of the more advanced eurapsids; they lived from the Early to Late Triassic period. Sea urchins: The few pencil urchins that survived the Permian period extinction are also the ancestors of all modern urchins; the Triassic period was also the time of the first burrowing urchins. Corals: First relatives to the modern corals evolved during the Triassic period. Crabs and lobsters (crustaceans): First close relatives of modern crabs and lobsters evolved during the Triassic period. Ammonoids (chamber-shelled organisms): Ammonoids rapidly diversified during the Triassic period. Bony fishes: Found in salt, brackish, and fresh water, and could often move back and forth among the three; they are divided into two groups based on their structure: the ray-finned (for example, the Triassic period’s Perleidus) and lobe-finned (for example, the Triassic period’s Diplurus). Sharks: During the Triassic, the intermediate form between primitive and modern sharks evolved; the earliest sharks evolved during the Paleozoic era, middle Devonian period, about 130 million years before; one of the modern survivors of this group is the Port Jackson shark. 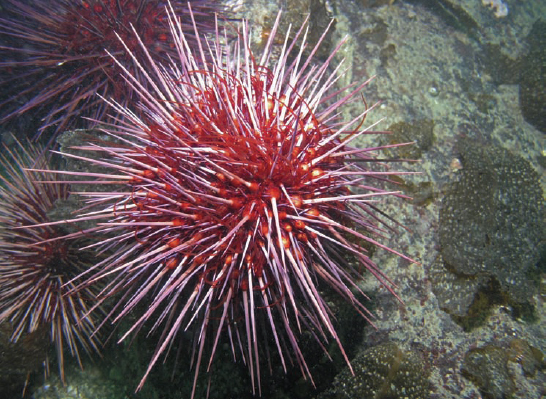 All modern sea urchins, such as this red sea urchin off the coast of British Columbia, are descended from urchins that survived the Permian extinction (iStock).